JustChat is an easy-to-use MSN chatting application which can help you chat safely and securely. 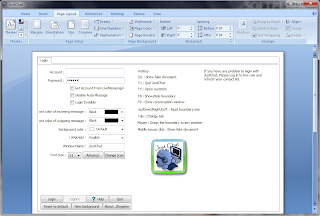 The JustChat window can pretend to be word, excel or any custom application layout. When you are using JustChat to chat with friends, your boss will think you are typing report, and you do not need to worry about boss finding out you are not working. JustChat can encrypt your instant message to prevent eavesdroppers from reading your chatting contents. It helps you chat with your friends even thought your school/company's firewall blocks MSN message connections. 6. Chatting content can be encrypted to prevent eavesdroppers from reading instant message.